A content modification policy can apply recommended security rules, determine if Internet searches should use SafeSearch functionality, warn about address spoofing and more. It can also ignore content thus making it possible to exempt content from modification for specific users or locations. You can create a content modification policy that enforces or ignores security rules, or SafeSearch, or both, for specific users at certain locations. 1. Go to the Guardian > Content modification > Policy wizard page. 2. Step 1: Who — From the Available users or groups list, select who the policy applies to. Tip: Enter a name or part of a name and Guardian will search for names of users and groups that match. Click Add and, when you have added all the users and groups, click Next to continue. 3. Step 2: What to target — From the Available categories or category groups list, select what the policy applies to. Tip: Enter the name or part of the name and Guardian will search for matches. Click Add and, when you have selected the categories or category groups, click Next to continue. 4. Step 3: Where — From the Available locations list where the policy will apply. Tip: Enter the name or part of the name and Guardian will search for locations that match. Click Add and, when you have selected the location(s), click Next to continue. 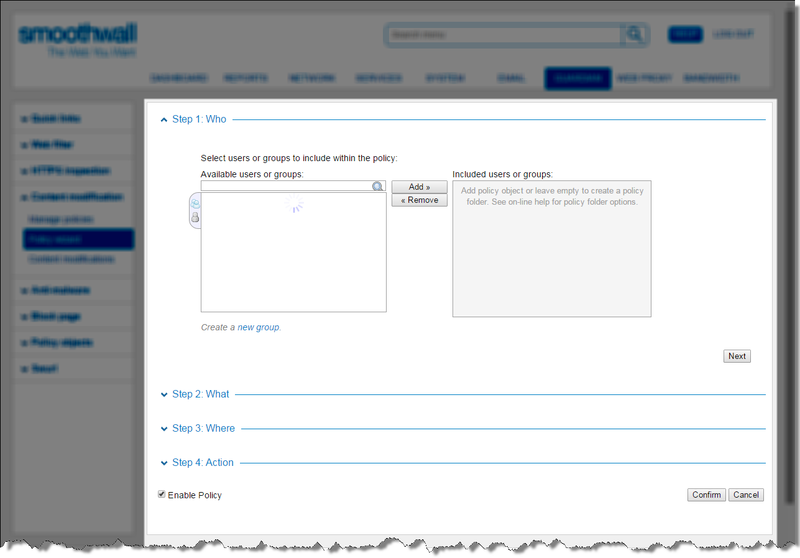 • Create policy folder — Select this action to group related rules in a policy folder. You can then use Apply or Ignore actions within this folder. For more information about policy folders, see Working with Policy Folders . • Apply — Select this action to modify the categories and category groups selected. • Ignore — Select this action to exempt the categories and category groups from being modified. Note: Usually creating a policy which ignores content implies that there is another policy which modifies content. For example, there might be an Apply policy which enforces SafeSearch for everyone, and another Ignore policy which exempts certain users who need unrestricted search. In such a case, on the Guardian > Content modification > Manage policies page, the Ignore policy which creates the exception must be placed before the Apply policy which modifies the content. • From the Available content modifications list, select the content modification to apply and click Add. If you are creating a policy that ignores content, the options here are disabled. Note: Each step must be completed in order to create the policy. If you skip a step, Guardian creates a policy folder in which you can store policies. For more information about policy folders, see Working with Policy Folders . 6. Select Enable policy to enable the policy and click Confirm. 7. Guardian displays the settings you have selected. Review them and click Save to create the policy. Guardian creates the policy and makes it available on the Guardian > Content modification > Manage policies page.